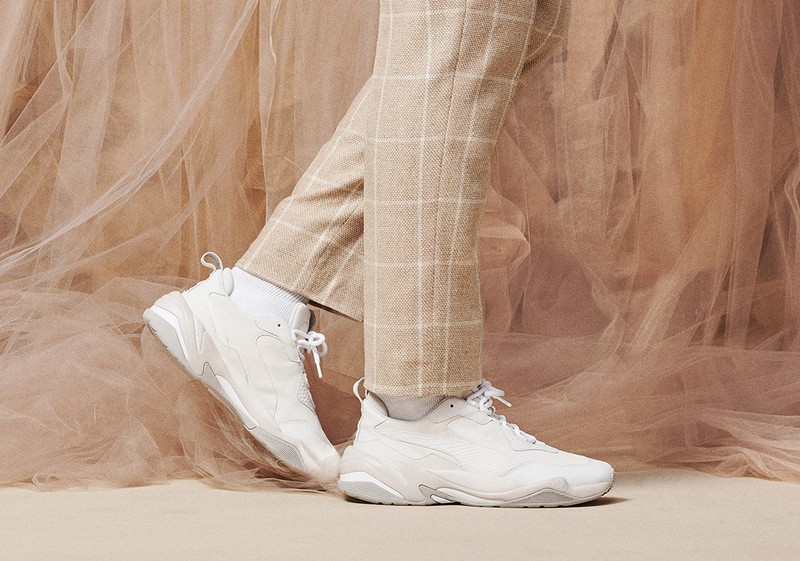 On August 2nd, the Puma Thunder Desert released in two simple color schemes for the ladies that utilized the sneaker’s complex layering to create a semi-luxurious looking shoe. Now, the men are set to get in on the action with two even simpler takes on the third addition to the Puma Thunder family by way of two tonal offerings – one white and the other black. While the darker of these two varieties stays uniform, the white pair does utilize cream and sail for a slightly more detailed look. Much like the previous two pairs, these Deserts come dressed in a number of materials, from their scaly midfoot formstripes, to the aforementioned layering that calls upon both suede and luxe leather for a more complex look. Fans looking to pick up a pair upon their release date of August 9th should check out our detailed where to buy list below and tell us which color you are partial to.